Due to gamers recalling SEGA’s ill-advised Outrun 2019, social media featured more predictable jokes about jetpacks and flying cars on New Year’s Day than usual. 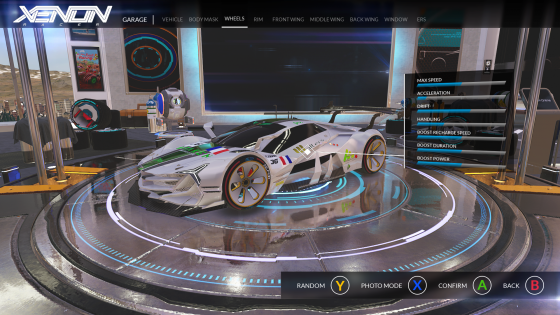 When 2030 – the year Xenon Racer is set – comes around, we don’t anticipate jokes about developer 3DCloud’s vision of the future. Eleven years from now, competitive racing still involves burning rubber on typical racetracks. Some creative flare is on display, but certainly, Xenon Racer doesn’t run with the idea of being set in the future. The vehicle selection entails a mixture of beefy muscle, sports and formula one cars with metallic sheens and neon rims, powered by a new energy source. This allows them to obtain top speed in a matter of seconds, as well as boost and drift around corners at high speeds. Racetracks, meanwhile, are set in locations around the globe, consisting of the usual tight corners, hairpin bends and open straights. Indeed, track layouts could’ve been lifted from just about any generic racing game. If you’re expecting corkscrews and loops, prepare for disappointment. 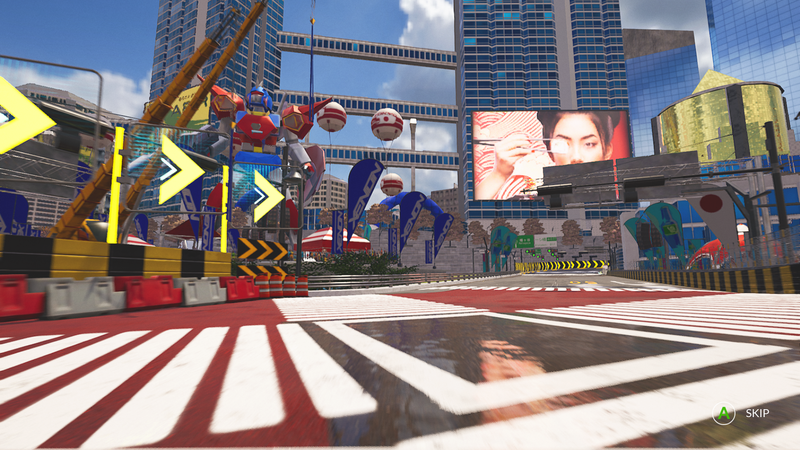 Due to the cars being seemingly glued to the track, there isn’t much potential for ‘catching air’ either. 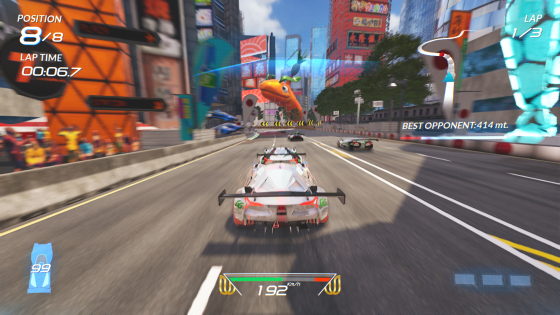 Anybody hoping for weapons and power-ups will also be left wanting – this is a straightforward drift racer that has more in common with Ridge Racer than WipEout or F-Zero. Although the drifting mechanics have been pulled off more skilfully in similar games, they’re still robust enough here. Using the e-brake, lifting off the accelerator for a few seconds before reapplying, or braking then accelerating commences a drift, and unlike many other futuristic racers, proficient braking is required to prevent collisions when cornering. The exceedingly shiny vehicles are surprisingly fragile, only able to withstand a small number of bumps and shunts. Even scraping along barriers will eventually result in an explosion, setting you back some distance after respawning. It doesn’t help that some tracks have immovable trackside clutter – such as barrels and barriers – on which it’s easy to become snagged. Even the AI doesn’t seem to be able to get around the track with skill and grace, often colliding into walls and skidding haphazardly around corners. And no, this isn’t for the sake of realism – they can be observed doing this on every lap. Other issues are sadly common. Once in first place, rivals will rarely challenge you. More damaging is the fact that they tend to bunch together, meaning every crash has the potential to send you to the back of the pack. It’s very hard to recover. So much so that spending entire laps at last place isn’t uncommon. Sometimes hitting the ‘restart’ button and trying again is the only way to eventually prevail. This makes the opening hour far tougher than it needs to be, forcing rookies to practice the basics on the opening grand prix. It’s astonishing to think this wasn’t picked up upon during playtesting. In terms of content, Xenon Racer is just about able to justify its £34.99 price tag. There’s a lengthy career mode that drip-feeds new tracks, both online and local split-screen play, and a few extras including time trials, an elimination mode, and some exceedingly tough checkpoint races. The online mode – in which it’s possible to create a lobby, choose tracks and set the number of laps – has a ranking system, but weirdly, experience is only awarded to the winner. There are no rewards for second place, which is rather discouraging when hit with a losing streak. So much for rewarding players for their time. The general presentation also leaves a lot to be desired. Menus are easy enough to navigate, and the drum ‘n bass soundtrack suits the experience, but the loading times are peculiarly long for something that only occasionally dazzles. The heavily built-up Tokyo tracks showcase the visuals at their best, with their brightly coloured billboards and towering skyscrapers. The rest of the tracks aren’t as pleasing on the eye (we were rather surprised to see motionless 2D crowds) and it certainly doesn’t help that the HUD is unremarkable, holographic rear-view aside. But the biggest killer of Xenon Racer’s atmosphere isn’t the irksome AI, but rather the laughably poor commentator. English may not be Italian developer’s first language, but we’re sure they could have come up with better lines then “That’s an error” when smashing into a wall at top speed, or “That’s bad” when failing a race. It’s enough to recall the days of PlayStation 2 budget games. In a way, we share the commentator’s lack of enthusiasm. 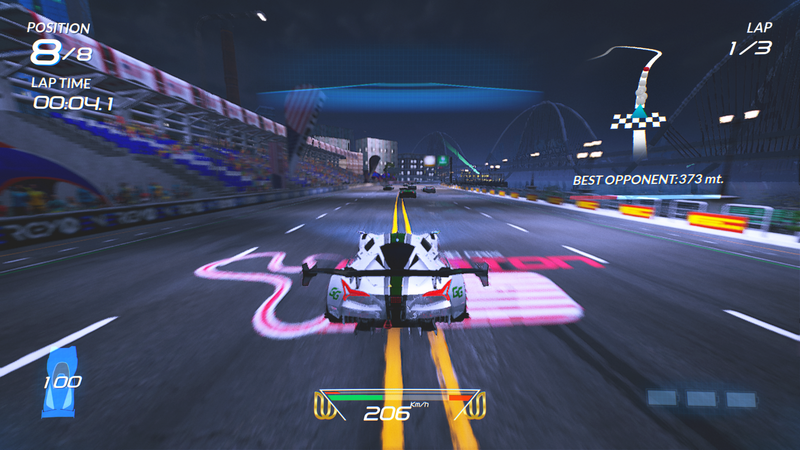 Even though performing several drifts in a row can be satisfying, Xenon Racer is otherwise bland, lacking spectacle and without a single standout feature. A narrow vision has ultimately resulted in something that both looks and feels positively ordinary; a misguided experience with no easily definable selling point.